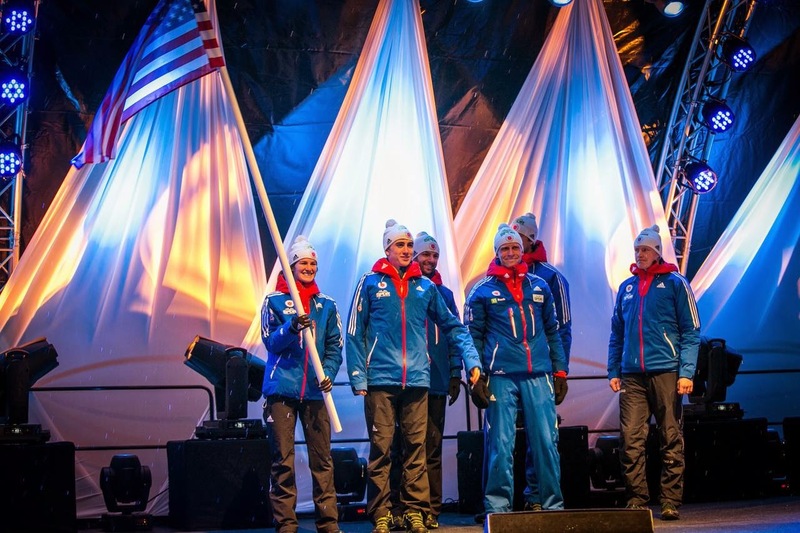 My last race at World Championships was the women's 4x6k team relay. It marked the third time that Susan, Hannah, Annelies and I competed as a foursome in the event, in that order. The first two times we placed 12th and 18th, and both times I had two penalty laps in standing. It is crucial to stay out of the penalty loop in the relay because for each shooting stage you have the five bullets in your magazine plus three spares you can hand-load if needed, and if you use eight bullets and still haven't hit all five targets, that's bad; you not only have to ski the penalty lap but you've already taken 10-20 seconds to shoot each spare. Our relay team with our biggest fans- my brothers! Susan got our team off to a great start, with the fastest ski time from the first leg, and used only two spares in prone and zero in standing to tag Hannah in 3rd out of twenty-five teams. Hannah had to use five spares and tagged off in 11th. Annelies kept the team in 11th, using two spares in each stage. She tagged off to me, right in front of Sweden, one of the teams we were trying to beat in the season-long Nation's Cup. I got off to a strong start: I cleaned prone and left the range in 8th place! Out on course I think I passed at least one team and came into shoot standing around 7th place, leading a train of teams. Then came the moment of reckoning: would I end up in the penalty loop like I had in the other relays?? I missed two shots out of five on my first pass. I was taking a lot of time on the range and some of the other teams had already shot clean and left the range, but I tried to stay focussed on shooting my spares. I had three spares for two targets. I hit the first one! Then I missed the second one! So I had to hit my last spare in order to stay out of the penalty loop. I took my time and I HIT the last target. After using all three spares and shooting pretty slowly, I left the range in 13th (you see, it really is better to hit all five on the first pass). Heading out for my final lap, I was about five seconds behind Poland, and twenty-five behind Austria and Canada. I passed Poland, and was gunning for the next two teams! Our coaches were screaming at me and I was skiing my heart out and trying to maintain hope that I could catch them. In the finishing stretch I crossed the line .8 of a second behind Austria and a few more behind Canada. I wish I could have brought us into 10th, but as a team we were happy to tie our season-best performance of 12th place, and although we used too many spares (eleven total), we all managed to stay out of the penalty loop. It was a very exciting race for me. I have so much work to do this summer but I am so excited to improve with the goal of doing even better on the World Cup next winter. 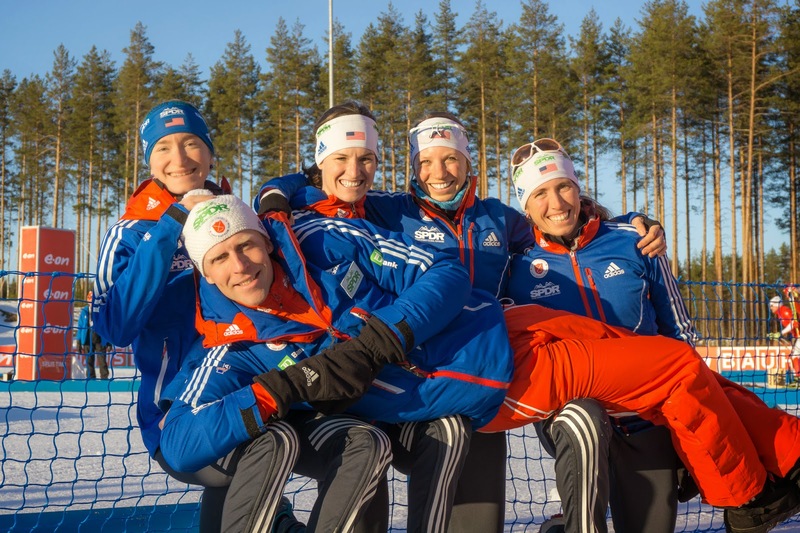 We did not beat Sweden in the relay, but we managed to stay in 15th place overall in the Nation's Cup score, which means our team will have four start spots for women again on the World Cup next season. If we had been 16th place, we would only have been allocated three spots. As the fourth woman on the team right now, this is a big deal for me! It is always better not to be on "the bubble", so both individually and as a team I/we will work towards being farther ahead in the rankings next year. 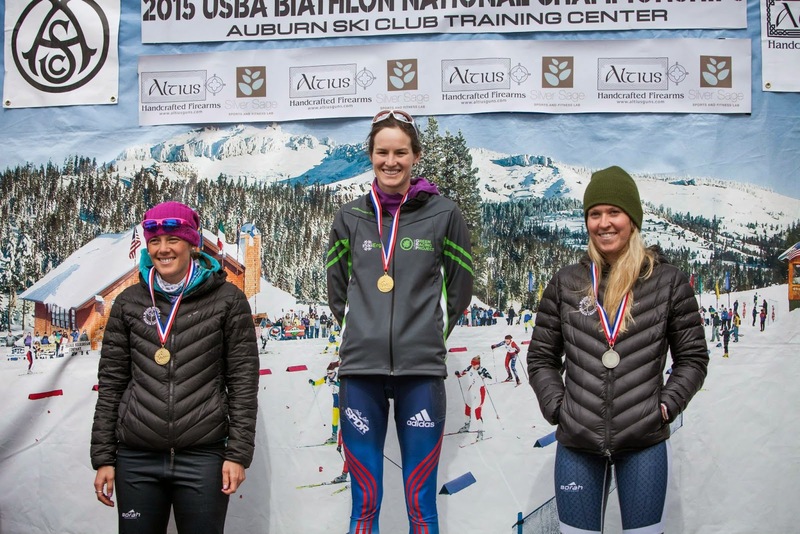 As a season finale, I am now in Truckee, CA competing at US National Championships. 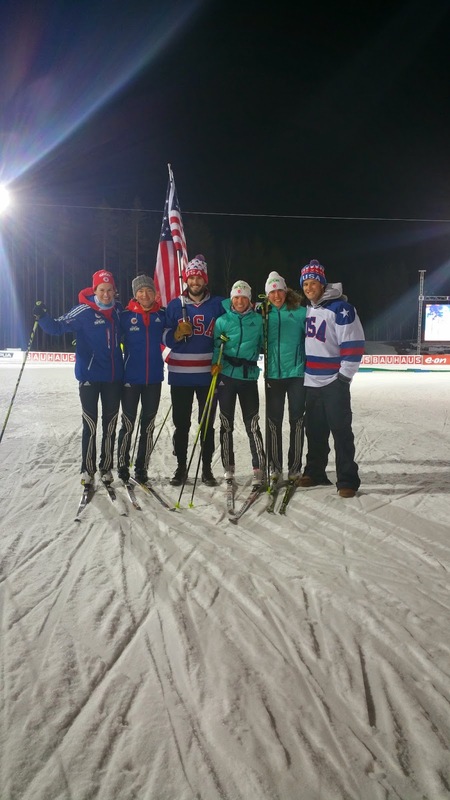 Susan and Hannah are at World Cup finals in Siberia (both racing in the mass start tomorrow, Sunday 3/22!!) 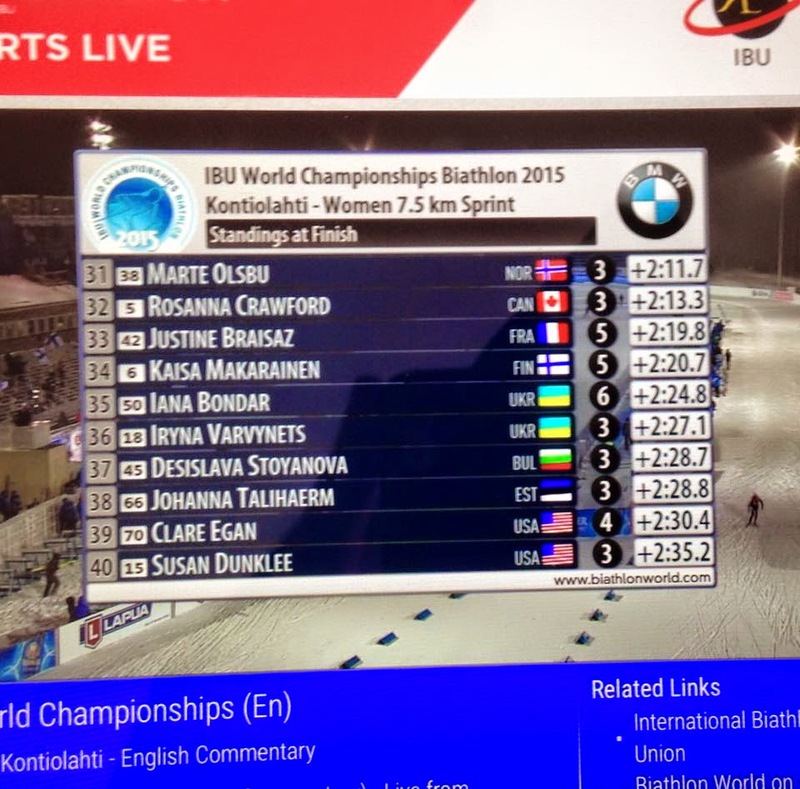 and Annelies closed out her season at World Championships. Without those three women here, the "National Champion" crown doesn't tell the whole story, but I earned it in both our races here this weekend. Guy came one day late with a new passport!!! The best part of World Champs for me- Guy and Graham on course!!! Wednesday's Individual was the race I am most proud of from this whole year so far. It was my first time shooting 80% (16/20 hits) on the World Cup (and only my 5th time ever), and I notched another top-40 ski time to place 51st. The shooting in the Individual goes prone, standing, prone, standing, and after cleaning the first two stages, I left the range in 9th place!!! 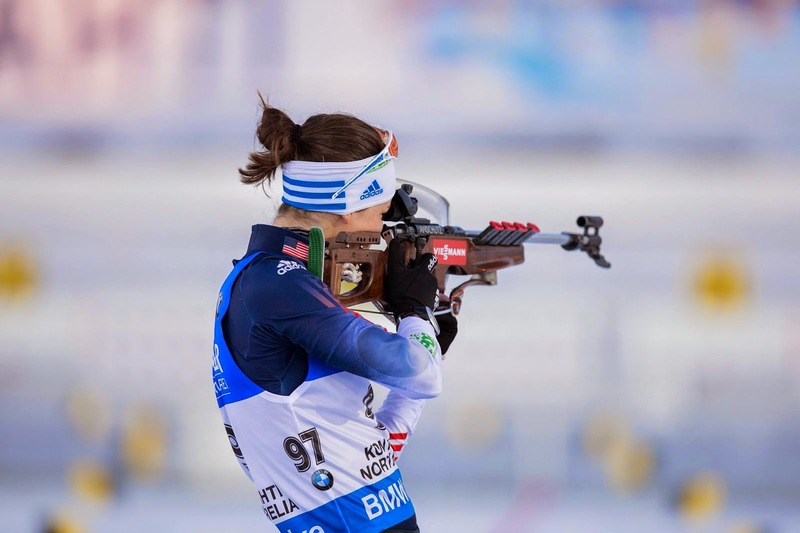 It is very motivating to know that if I ski and shoot my best, I can compete with the top ten in the world. It was also only the second time I have ever cleaned a standing stage in competition, so to do so at World Championships felt great. 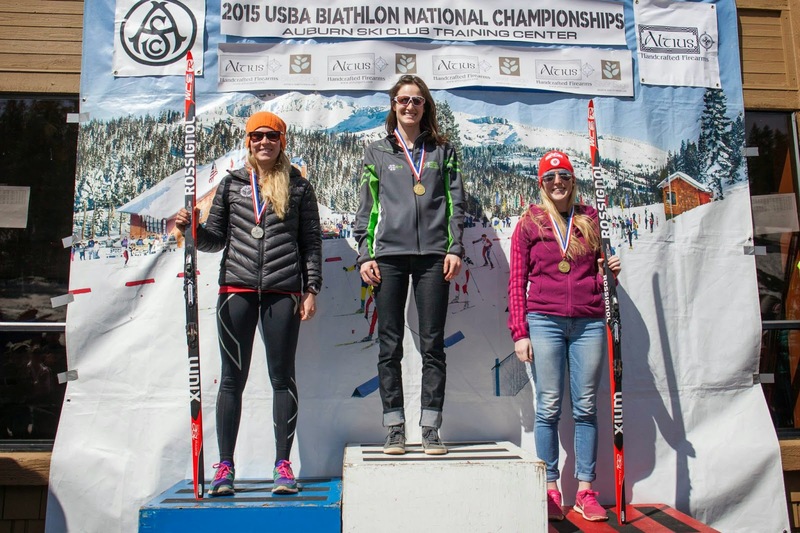 Here's a link to Fasterskier's recap of the women's Individual. Shooting prone, as seen on TV! My last World Championships race is today, Friday 3/13, at 6:15pm local time/12:15pm EST. It is the women's team relay. Team USA consists of Susan Dunklee, Hannah Dreissigacker, Annelies Cook and me, in that order. In the women's relay event, each person skis a 2k loop, shoots prone, skis another 2k loop, shoots standing, and then skis a third 2k loop and tags off or finishes. For each shooting stage, in addition to the five bullets ("rounds") in the magazine, you can hand-load up to three spare rounds if you need to. If you still have un-hit targets after using eight bullets, you have to ski the corresponding number of penalty laps. Our team's best result so far this year was 12th place. You can watch live or replay here. I finally made my way out of the teams' area and into the spectator section. What a scene! Food stands advertising "Delicious Foods from Lapland," small unattended camp fires surrounded by wooded planks on which fish are smoked, people of all shapes and sizes from Finland, Russia and all over Europe enjoying beers and biathlon. The stadium usually fills up with fans several hours before the race starts. 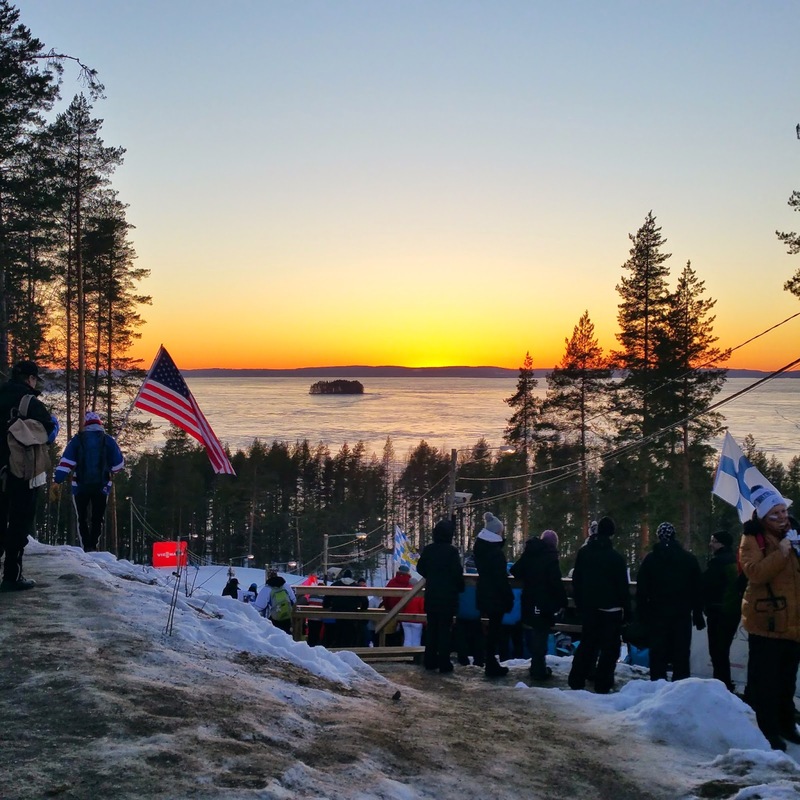 Yesterday fans and athletes alike enjoyed the Scandinavian sunset as the 6:15pm start time approached. The silver lining of being so far north that you have a low winter sun that takes forever to set, leaving you with lingering orange skies. Behind the scenes, the athletes are warming up and ski wax technicians are making sure the athletes' skis are going to be as fast as possible. Our team has eight athletes here and four wax techs. Most athletes have at least 8-10 pairs of skis but some have more. Some teams have designated 18-wheeler trucks that carry their equipment around to all of the World Cups. Norway, Russia and Sweden are a few of the teams with wax trucks. Teams who don't bring their own trucks can use one of these containers. 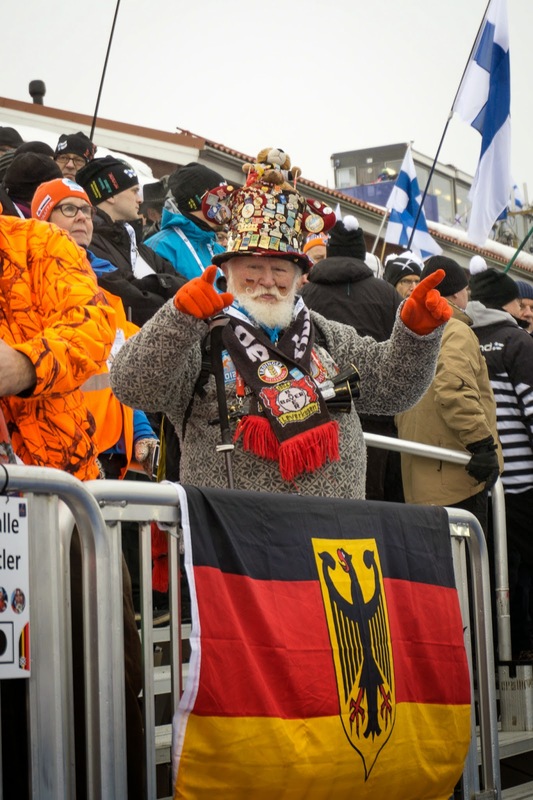 The magic also happens at this one funny place that every biathlon World Cup, World Championships and Olympic venue has: the "Family Club", also known as the "Upsilon", or the "Y." It is a cafeteria that serves free food to athletes and staff all day long. Can you believe it??? A BMW parked on the course, of course! And lit trails! We race at night so fans can watch live on prime-time TV. And here's something you don't see at every race, but wish you could: MY BROTHER GRAHAM. He flew in all the way from NYC to cheer for me. My other brother, Guy, was scheduled to come on the same flight, but was not allowed to get on the plane because his passport expires in one month. (Apparently it needs to be valid for three months from your date of arrival in Finland.) BUT, nothing would stop him!!! He went to the NYC passport office the next morning at 7:30am and by 3:30pm had a new passport, and then sped to JFK in time for next flight to Helsinki. He is now here safe and sound. Photos of all three of us to come! Wellesley Ski Team: It Lives!!! When I was a freshman at Wellesley College, my friend Jackie (an alpine skier) and I founded the Wellesley Ski Team. The current club president saw a news story on Wellesley's website about me and got in touch with me through my blog. It makes me so proud that five years after I left Wellesley, the little club still lives! 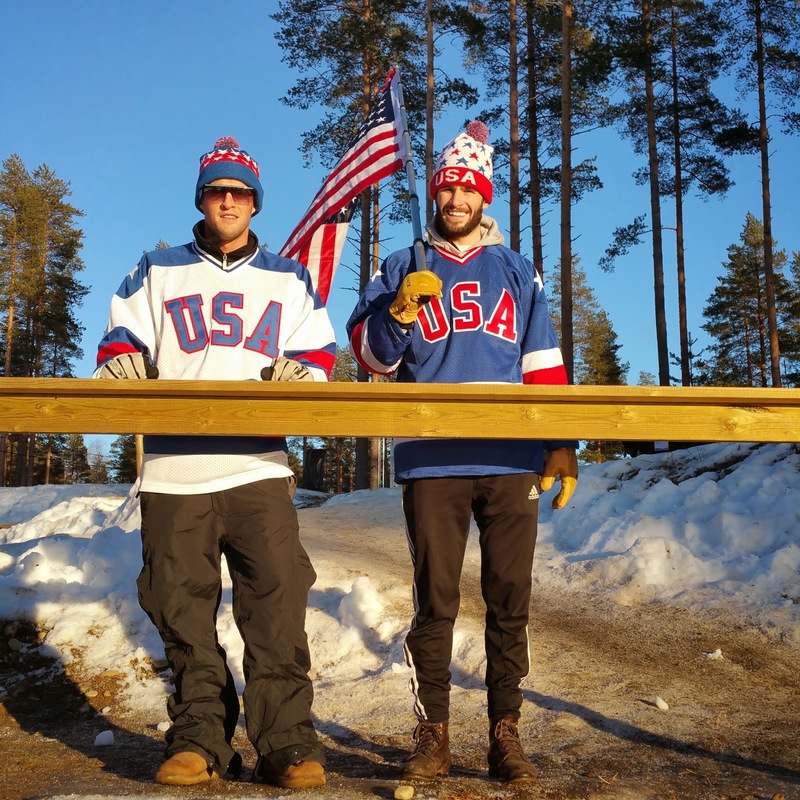 Post by Wellesley Nordic Ski Team. I raced in my first World Cup pursuit on Sunday. Since I finished 2 minutes and 30 seconds behind the winner of the sprint on Saturday, I started 2:30 after her in the pursuit. That's how the pursuit works. So all 60 racers start within the first three minutes or so, and the first one to cross the finish line wins. It is exciting to have all those people on the course and the range at once. By shooting well you can pass a lot of people while they are in the penalty loop, and vice versa! I started off well, missing only one target in each of the first two (prone) shooting stages. But I am not as good at standing yet and missed a total of 5 shots in the two standing stages, so I spent a lot of time doing penalty laps while people passed me. I started the race 40th and finished 52nd. One thing I was very glad about was that I had the 43rd-fastest ski time. 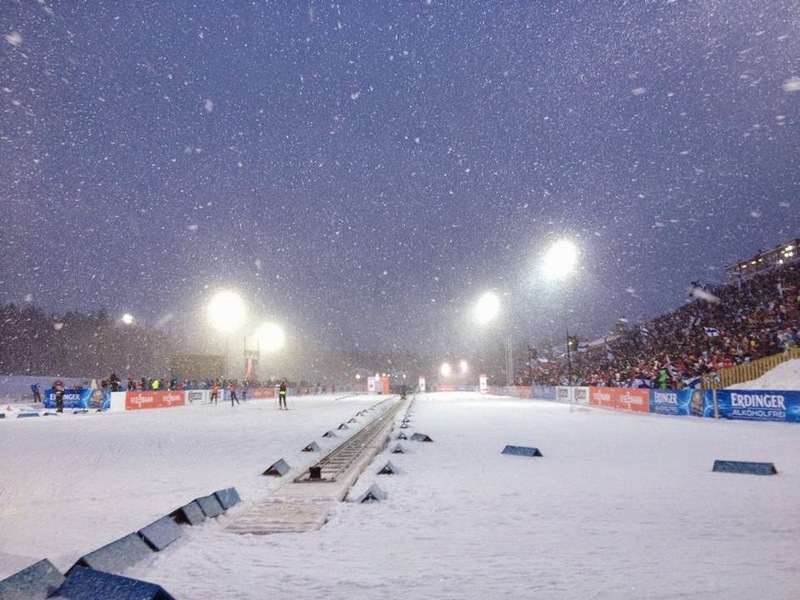 Before this weekend, my best World Cup ski time rank was 63rd, so when I had the 39th-fastest time in the sprint, I had chalked it up to a fluke because of the weather. Not so! Today we have the Individual race. The first woman will start at 6:15pm local time/12:15pm EST. I am bib #97 so I will start at 7:03:30 local time/1:03:30 EST. As always, you can watch live on Eurovision. 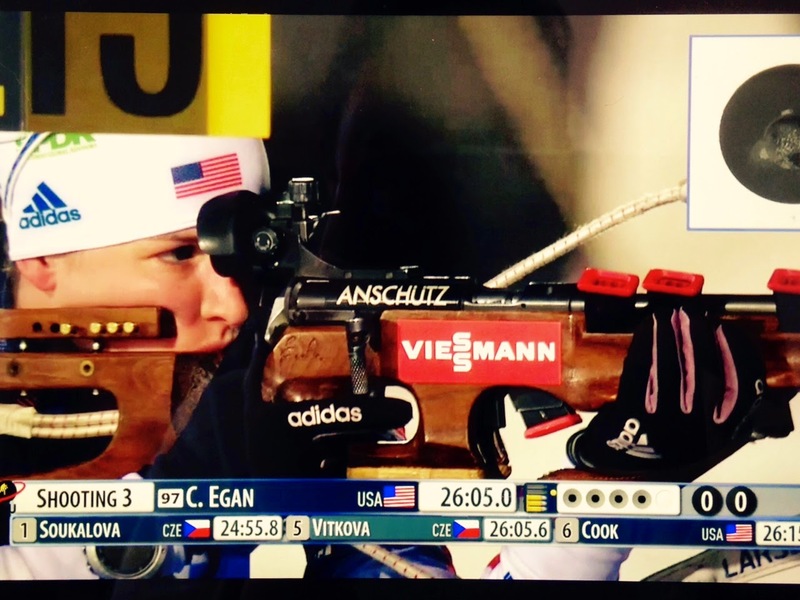 The women's Individual is our longest event; it is 15k total, with four shooting stages (prone, standing, prone, standing). Instead of skiing penalty laps, there is a 1-minute time penalty for each miss. Here is a great article from Glenn Jordan at the Portland Press Herald (Portland, Maine). Glenn has reported on my athletic endeavors since I was a cross-country runner at Cape High School. 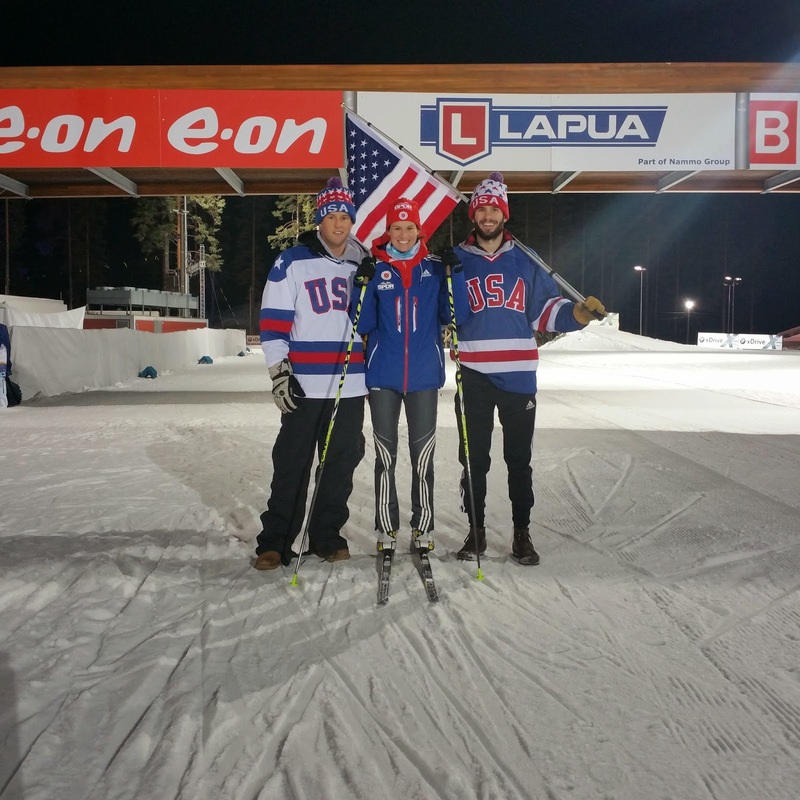 For this story he did a really nice job explaining-- in remarkably few words-- the sport of biathlon and my history in it. Today was an "anything can happen" kind of day. There was a pre-race blizzard that left fresh powder all over the trail for the early starters to plow through, and we were once again faced with strong, gusting winds. Even some of the best shooters missed a bunch, which sort of evened the playing field for people like me, who might miss a bunch either way. By the time I started with bib 70, thirty-five minutes after the first person, the snow had stopped and the tracks were slick and skied-in. I missed my first two shots in prone, but hit the last three. After the race, when my coach showed me a picture of where my shots landed, I realized I was lucky to have hit any of them: I had a tight group right on the very left edge of the target, caused by strong wind moving from right to left. I did check the wind flags before shooting, and I thought it was the same as when I zeroed my rifle before the race, but it was stronger, and I should have adjusted my site. Out on the course, the conditions were so much faster than they had been all week that I didn't even know how to take some of the turns at high speed. The course here suits me because it has a few big hills, including one very long and steep one. I am not the strongest person out here (ha!) but I am light and I have a "big engine". I also have been working with my coaches a lot this week on how to ski faster on the flats, and I think I did a good job of that today. When I came in for standing I chose a point beside someone else, hoping they would block the wind for me a little, and I think it helped. I also got lucky and didn't have major gusts like some of my competitors. I missed my second and fifth shots and then got going again. I thought for sure that with four misses I would be in like 90th place, so I was shocked when I heard one of my coaches yell "55th place!" Knowing that the top 60 qualify for the pursuit, I really started hammering! When another coach yelled "35th" place, I was sure either I had misheard him or we were having a language barrier problem. 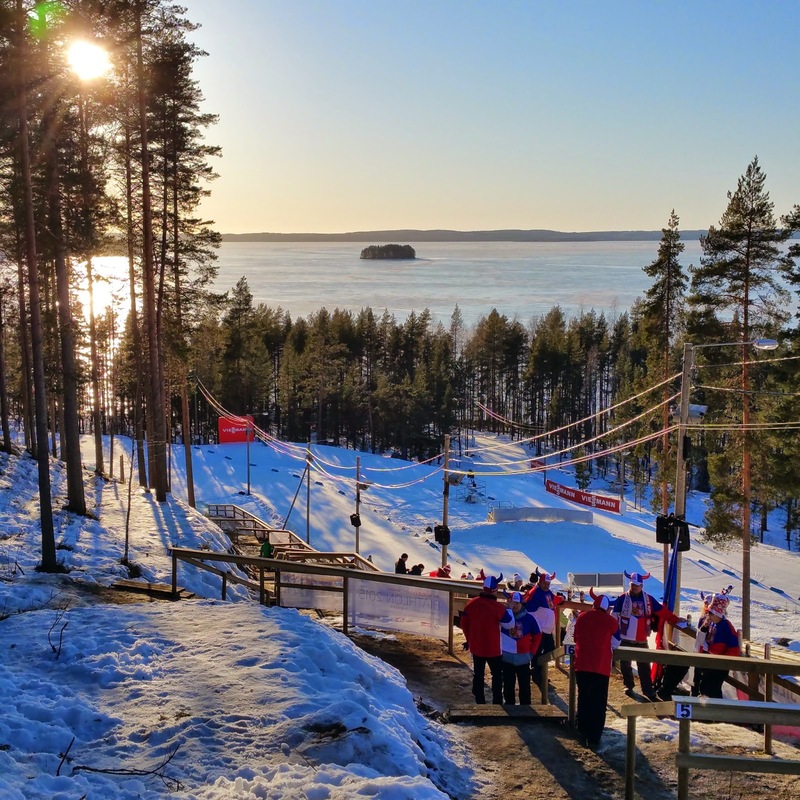 But it turns out that with fast conditions and fast skis, I managed a top-40 course time, and when I combined that with a top-40 range time and 4 misses, I finished in 40th place! I guess I misheard the first coach, who actually said 35th too. The top 40 finishers earn "World Cup Points," so today I earned ONE World Cup Point and am now officially ranked (last) (...among the ranked people!!!) on the overall World Cup Standings. This was my first top-60 World Cup finish and tomorrow will be my first pursuit. My teammate Susan finished 5 seconds behind me today, so she'll start 5 seconds behind me tomorrow. I am looking forward to getting passed early on by her, and then hanging on for dear life! I had lots of people watching back home, including those who sent me these screen shots of the live feed. THANKS FOR WATCHING!!! Tomorrow's race is at 17:00 local time, which, if I am not mistaken, after daylight savings time kicks in, will be 11am EST on Sunday morning. 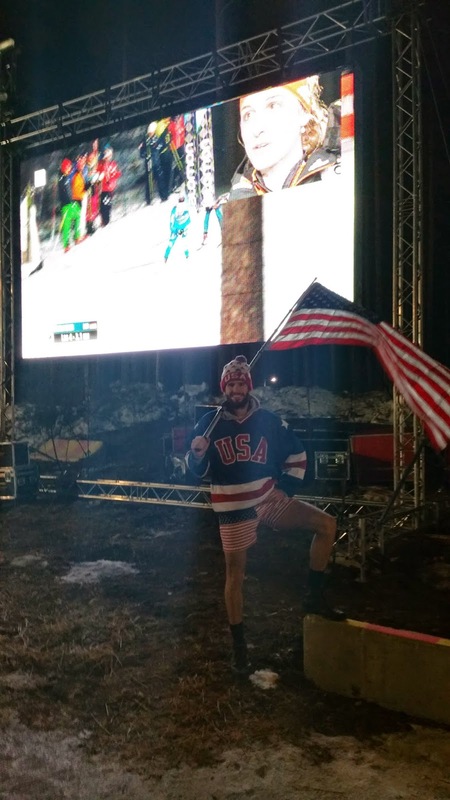 I was very proud to carry the flag for team USA at the opening ceremony of World Championships, here in Kontiolahti, Finland! 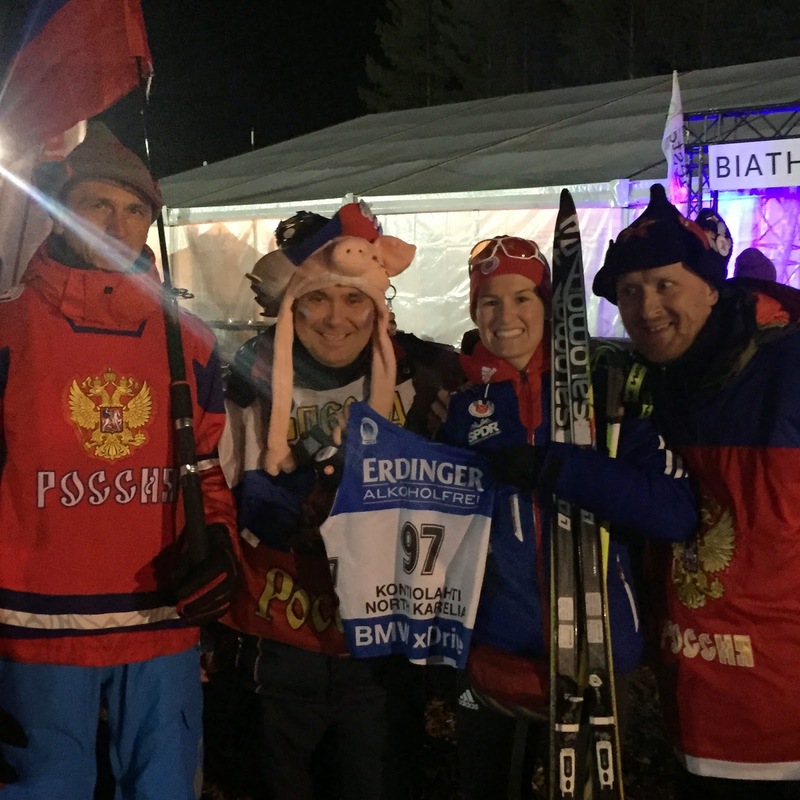 Of course, the reason I was chosen to carry the flag was so our top athletes could stay home and rest up for the mixed relay-- an event which I was not part of. But somebody had to carry that flag! It is always an honor to bear the flag and represent our country, and I feel that way every time I put on our uniform. 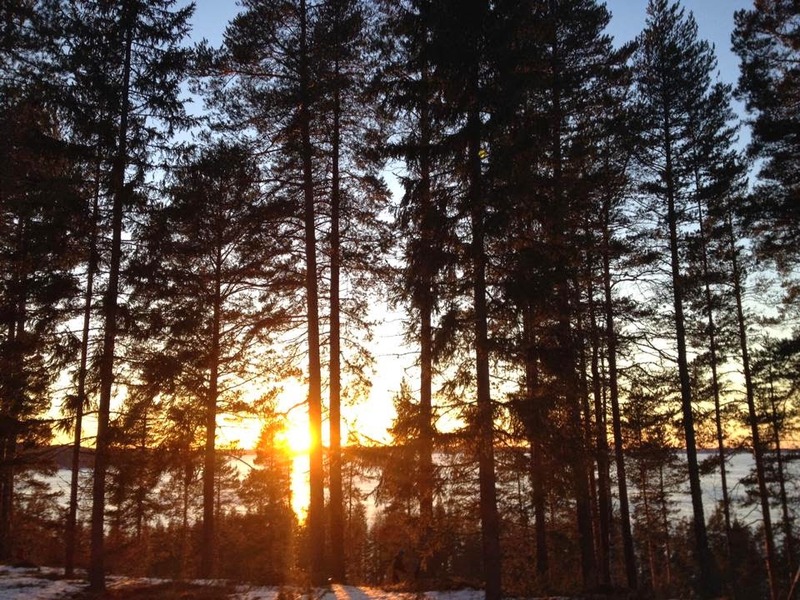 We arrived here on Monday, after a two-week training camp in Norway. Other than gray skies and deep, slushy snow on the course, my experience here so far has been good. I shot really well in practice yesterday, which gave me a much-needed confidence boost for my upcoming races. The sun is even sort of trying to show itself today... so maybe that is a good sign for the weather to come! Another good sign was that I dreamt that I came in 59th in the sprint. The top 60 finishers in the sprint qualify for the next day's pursuit race, so that is a goal of mine. I would have to shoot very well-- at least 8/10 shots-- to have a chance. Yet another good omen is that my TWO BROTHERS ARE COMING!!! I just had a skype conversation with my older brother, Guy, and he broke the news that he and my younger brother Graham will both be here next Wednesday through Sunday. 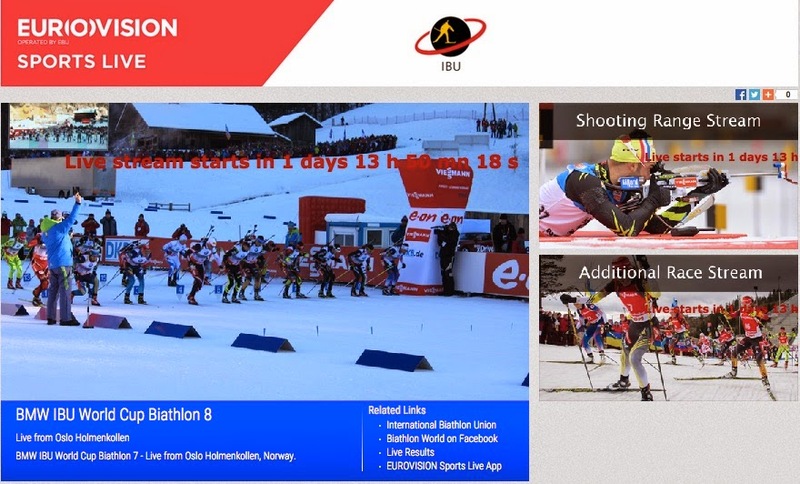 Neither of them have ever been to Finland or a biathlon race, so this is very exciting for all of us. 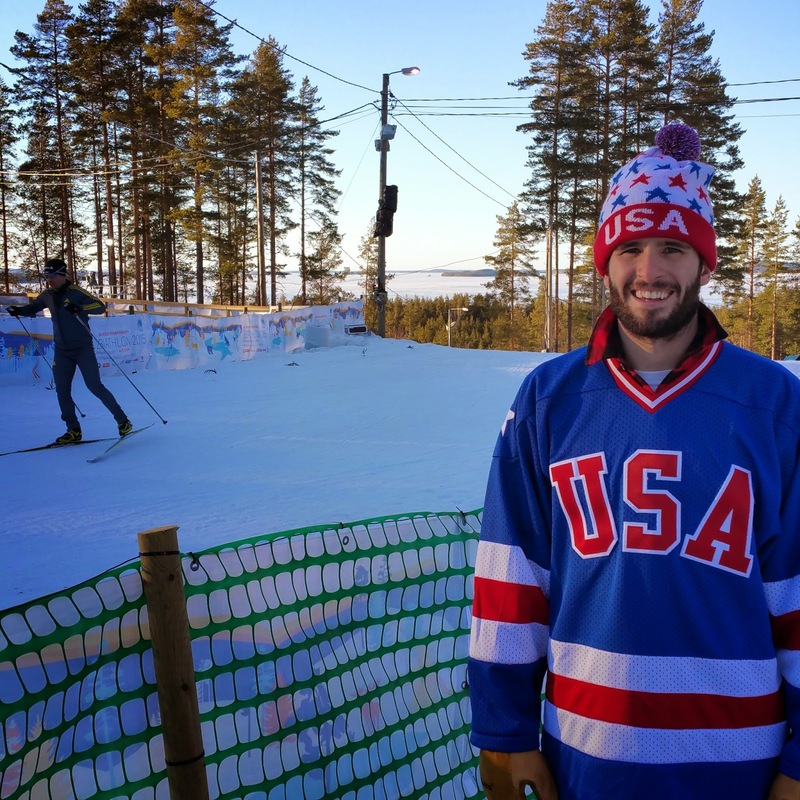 My parents came to World Cup 8 in Oslo and now my brothers are coming here, so I have had 100% family representation already in my first year on the team. Being the rookie at World Championships is overwhelming at times. I am one of the least experienced people here. When I think about my long-term outlook in this sport, I feel very confident about where I am headed, but for sure when I think about the upcoming races, I have moments of uncertainty. It's important to block those thoughts out. I have a great opportunity right now to practice for next World Champs, when I won't be the rookie anymore.